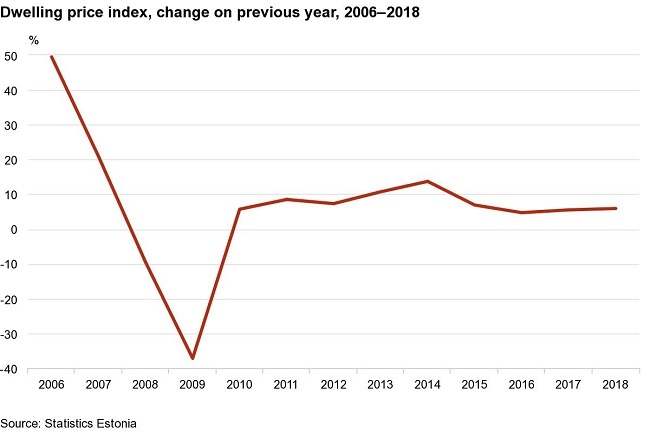 he prices of apartments increased in all three areas under observation: by 6.6% in Tallinn, by 7.3% in areas bordering Tallinn with Tartu and Pärnu cities, and by 3.6% in the rest of Estonia. In the 4th quarter of 2018 compared to the 3rd quarter, the Dwelling Price Index increased by 2.8%, and compared to the 4th quarter of 2017, by 5.7%. In the 4th quarter of 2018 compared to the same period a year ago, the prices of apartments increased by 5.7% and the prices of houses by 5.6%. The Owner-Occupied Housing Price Index increased by 6.9% in 2018 compared to the average of 2017. In the 4th quarter of 2018, the Owner-Occupied Housing Price Index changed by 2.1% compared to the 3rd quarter and by 4.2% compared to the 4th quarter of 2017. The Owner-Occupied Housing Price Index is published on the base 2010 = 100. The time series starts from the 1st quarter of 2005; major repairs and maintenance are included from the 1st quarter of 2007, and insurance connected with dwellings is included from the 1st quarter of 2012.